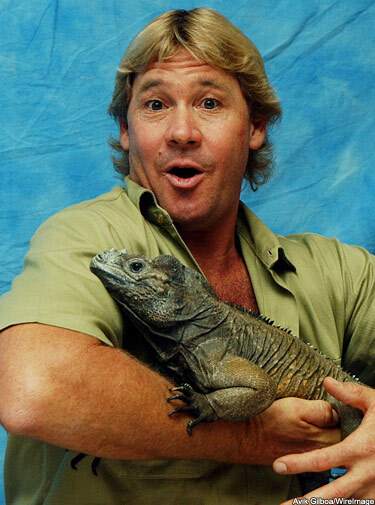 As you may by now have heard, yesterday (September 4th) came the sad news that Steve Irwin has died. Over the years there have been a few stories erroneously announcing his death, typically involving crocodiles or venomous snakes, but this time it's no hoax. Steve really is dead. It was while filming a segment on the Great Barrier Reef, Queensland, for his daughter Bindi's documentary Ocean's Deadliest that he was fatally pierced in the chest by the barb of a stingray. Though taken immediately by helicopter to Cairns Base Hospital he was pronounced dead by noon. He is either the second or third person in Australian history to have died this way (sources differ). So far I haven't read which stingray species was involved, but it was presumably a large one, with an estimated length of 2.5 m. The tails of large stingrays can be lashed with enough force to drive the barb into wood and other hard objects, and they can reputedly pierce right through a human arm or leg. The barbs are serrated, up to 20 cm long, and connected to venom glands. One report I read stated that the venom would not have been a factor in Steve's death, rather it was the traumatic injury caused to his heart. Steve's approach to wildlife film-making was often criticised, mostly because he tried too hard to get the animals to interact with him (hardly an approach that encourages people to respect wildlife). He was also charged at times with disturbing marine mammals and other wildlife, and of course there was the notorious 2004 incident when Steve took his baby Bob into one of the crocodile enclosures at his Australia Zoo. But despite all this I think that, ultimately, his efforts and interests were worthy of respect and he had nothing but a sincere and dedicated attitude to the conservation and well-being of animals. In all of his TV programmes he emphasised the importance of conservation and education, and he does appear to have gone out of his way to encourge children to take an active interest in these areas. He founded the Steve Irwin Conservation Foundation, later renamed Wildlife Warriors Worldwide. There is also no doubt whatsoever that his knowledge and experience of wildlife was considerable, and he knew the herpetofauna of Australia and other countries down to the subspecies level. He published at least some technical articles and could easily turn his hand to the dissemination of academic information: he wasn't only a populariser. Sure, he was a character, but then that's pretty much the only way of making a name for yourself on TV today it seems. My thoughts today are with his family, and I honestly feel a sense of loss. For those interested, the official Queensland Police Service statement can be found here. As much as Irwin infuriated me as a wildlife educator and show presenter myself, I always had to admit his merits. In world where most were only concerned with "charismatic megafauna," Steve taught the upcoming generation to love the creepy crawlies as well. Krikey! Some the coolest creatures are slithering!! And some may remain so because of Irwin's work. May he rest in peace. My feelings exactly, Darren. I have two nephews who come to me for info about snakes and other small critters-- but their inspiration was Steve Irwin. I also HATE comparisons of him with that neurotic California ninny Timothy Treadwell, who died because he understood nothing of animals. Ironically, during that weekend I was on a weekend away with my two toddlers where we rescued a bearded dragon from the roadside (cameras and all) and later - the hour Steve died - found a nudibranch washed up on the beach which was still alive. On handling the sea slug, it released a gorgeous magenta ink into the sea - a defense mechanism no doubt. In hindsight it was like the wildlife of the Australian shores were bleeding for Steve. Although I'd have rescued both those animals whether or not I'd ever seen a Crocodile Hunter show, somehow you can't do that these days without Steve in mind. In our family, such encounters with wildlife are called "Steve Irwin moments". (We put the nudibranch back out to sea, by the way). A longer tribute, and call to local conservation action, can be found at Where Light Meets Dark.